I watched the moorhens circulate about on the water surface of a pond at Brazos Bend State Park for quite some time, generally staying in the same place for some minutes and casually swimming to a spot within a few feet after they had finished with the first. The duration of the time I was there, most did not stray far from their original location, typically staying in the sections of the lake that had more plant material noticeable at the surface. Intermittently squawking and croaking, their primary activity was dipping their beaks into the water. I could not quite tell what they were eating. After looking it up later, they were probably consuming seeds of grasses and sedges and perhaps some snails. There was little obvious interaction between any two members of the population. At one point I saw a couple flap their wings and zoom to a different part of the lake (about five feet away), but that was the height of activity amongst the birds. The bill was easily the most remarkable feature that enabled me to distinguish it from the American coot. Despite previously observing a multitude of these coots at another lake and having some time to get familiar with their characteristics, the two species are quite similar and difficult to tell apart, especially to an inexperienced birder such as myself. After some research, I discovered both are in the same family, Rallidae, which is composed of birds referred to as rails. Both are dark-feathered birds with triangular-shaped bills. I had decided to watch the common moorhen closely because the vast quantity of them would allow me to view a wide variety of behaviors. Thankfully, except for the yellow tip, their bill is red throughout, including its connecting frontal shield which extends from its upper mandible to its forehead. The coot’s, on the other hand, is almost entirely white with a black mark near the tip. 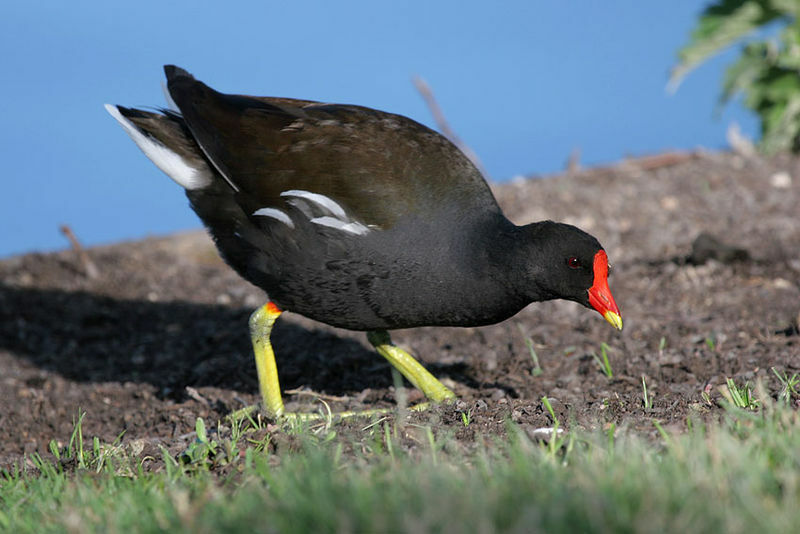 The common moorhen’s red bill is so conspicuous that it appears nearly fake. It looks to me like someone cut out an oddly-shaped piece of plastic, formed a muzzle of sorts, and slipped it over each bird’s face. I wonder how such a unique color and shield shape could have arisen evolutionarily? Perhaps certain shapes, sizes, and colors are selected for by some mechanism of natural selection. As a side note, to learn a LOT more about the process of natural selection (as well as other fascinating observations about the process of evolution), I urge you to read The Selfish Gene by Richard Dawkins, a must-read for any evolution scholar or enthusiast. 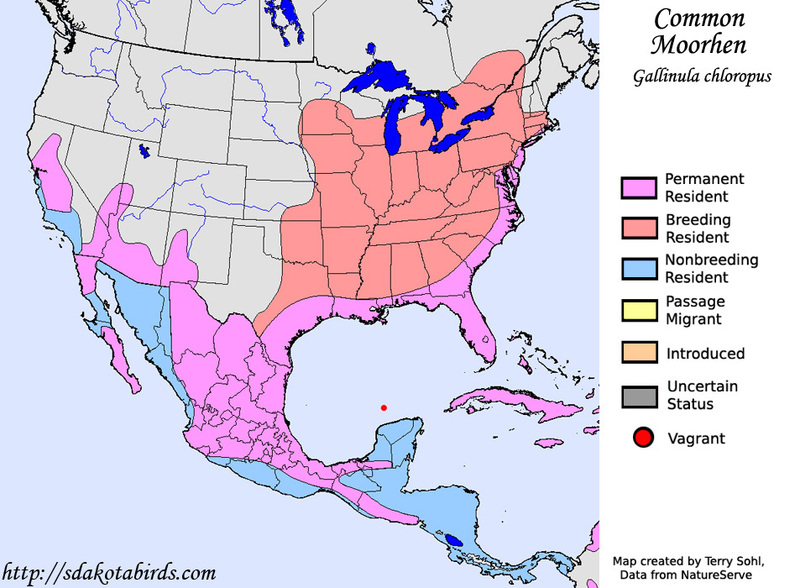 Having pondered about the curious shape and colors of the common moorhen bill on my own for a sufficient length of time, I decided to satisfy my curiosity and check out the primary literature on Gallinula chloropus. Factors such as shield color and size are related to certain indices of body condition. F. Alvarez, C. Sánchez, and S. Angulo determined that these variations are probably used as indicators of health to opponents of the common moorhens. This makes sense, as according to Stefano Fenoglio, Marco Cucco, and Giorgio Malacarne, this species displays a high level of intraspecies aggression, and the shield is displayed prominently during conflicts. Aggression is also associated with testosterone levels, and as might be expected, higher testosterone levels have been shown to be connected with larger shield size, thickness, and increased color. Interestingly, this is shown in both sexes. Reflecting on the behavior of the birds, this is expected as females are also very aggressive. Since competitors are the main audience meant to receive the common moorhen’s message of health and body condition, sexual selection is not the primary reason for variation; however, since organisms base their choice of mate largely on their level of health and quality of body condition, the color of the shield is also a method for signaling to potential mates that they are a great choice. So sexual selection also does play a role in the color, shape, and size. According to the Alvarez et al paper, conspicuous coloration is often a sign of the individual’s condition because “only the more healthy individuals can afford the costs of developing such coloration.” Because of this, coloration is a very honest signal, as lesser fit birds cannot afford the cost of producing a shield with a more intense hue. A positive correlation has been discovered between shield size and body size in females, and researchers discovered a negative correlation between hue and body size in males. There was also a general trend between larger shield size and a better leukocyte index (figure 1), which indicates that bigger shield size is an indication of stronger health. As is often true with science, these results are by no means infallible. A study performed by Fenoglio et al, mentioned above, found little significance in the red coloration of the bill and shield but found that yellow color intensity was a strong indicator of the health status of the birds, while the first study I mentioned found little meaning in the results from studying the yellow portion of the bill. Quite interestingly, the Fenoglio et al study mentions that overall, there isn’t a significant difference between bill and shield coloration between males and females. They suggest that this is due to equal participation in brooding and parental care between the sexes, and so sexual selection has worked equally between males and females. I noticed while observing the birds that there did not appear to be drastic differences between the shield colors of male and female birds, and it appears that this difference does not exist because both sexes are doing the selecting. One aspect the other papers touched on but did not delve into were the relationship between these indicators and disease. The Fenoglio 2004 study found a negative correlation between frontal shield redness and bacterial presence, while the yellow portion of the bill showed no correspondence to any bacteria. 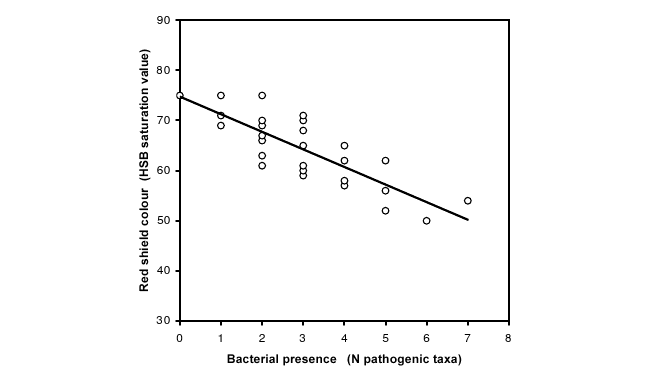 The researchers concluded that the frontal shields act as a signal of health, where the shade of red indicates the level of presence of cloacal bacteria (figure 2). During my trip to Brazos, I spent some time observing common moorhens at one particular body of water and its surrounding areas. The number of individuals I saw was immense. It gave me much time to note the differences and similarities between the frontal shields and bills. Overall, the range in size, shape, and color of the shields was not extremely wide, but there were certainly noticeable differences among individuals. While the answers are not definite, it appears that the size and color of the bill and shield are expressions of health and fitness, meant as a sign to potential competitors for resources. The variation in shields between individuals is significant and meaningful in their interactions with other common moorhens. This paper also explained the correlation between size and coloration of the shield and of the bill with body indices, but with different results. This paper discussed the relationship between shield coloration and presence of bacteria. Used this for background info for the common moorhen. This paper provided the information for the section on testosterone. Figure 1. From Alvarez et al 2005. 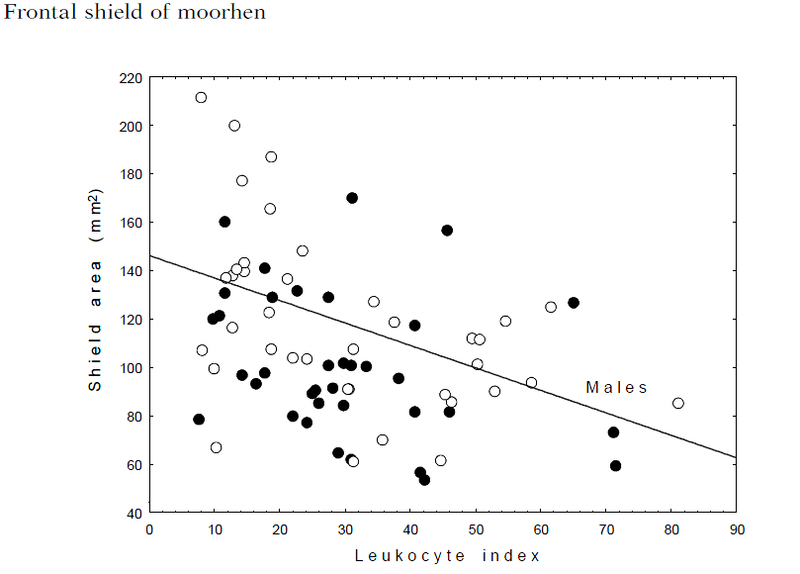 This graph depicts the correlation between a more favorable (lesser) leukocyte index and a larger frontal shield area in male common moorhens. Figure 2. From Fenoglio et al 2004. This graph depicts the relationship between bacterial presence and the red color of the shield. I am a junior studying Ecology and Evolutionary Biology at Rice University in Houston, Texas. This entry was posted in Coots & Moorhens and tagged Birds, Brazos Bend State Park, Common Moorhen. Bookmark the permalink.